John Eric Winchester is a fictional character on The CW's series Supernatural, and the protagonist of the comic book spin-off series Supernatural: Origins. Developed by series creator Eric Kripke, the character is mainly portrayed by Jeffrey Dean Morgan. John is the father of Sam and Dean Winchester, the show's protagonists. Seeking revenge after his wife Mary was killed by the demon Azazel, John Winchester became a hunter and raised his two sons to fight the supernatural. John disappears early in Supernatural, and the first season revolves primarily around Sam and Dean trying to find him. Morgan was also filming episodes of Grey's Anatomy while the first season of Supernatural was under production, and future appearances of the character were hindered by his busy schedule. While Morgan's portrayal has been praised, fans and critics were generally frustrated at the character for keeping so many secrets. On December 12, 2018 it was announced that Morgan would return for the show's 300th Episode titled "Lebanon", reprising his role as John Winchester. The father of series protagonists Sam and Dean Winchester, John Winchester first appears in the pilot episode of the series, but plot devices such as flashbacks and time travel detail his background in later seasons. Apparently abandoned by his father at a young age—his father actually died while serving a secret order known as the Men of Letters—John Winchester grew up hating the man. John left high school to join the Marine Corps, eventually attaining the rank of corporal and receiving many medals for his service in Vietnam. After leaving the service, he found a job as a mechanic, and fell in love with Mary Campbell. In the fourth season episode "In the Beginning," Dean is sent back through time by the angel Castiel. Dean meets his parents' former selves, and ends up convincing John to buy the 67 Chevy Impala that he eventually inherits. Dean later watches John being killed by Azazel, though the demon then resurrects him in exchange for Mary's permission to enter her house in ten years. When the angel Anna Milton travels back in time in the fifth season episode "The Song Remains the Same" to prevent the births of Sam and Dean, John agrees to serve as a temporary vessel for the archangel Michael to stop her. Michael subsequently kills Anna and erases John and Mary's memories of the incident. Azazel later uses his pact with Mary to enter their home in the pilot episode, and ultimately kills her. The second season episode "All Hell Breaks Loose, Part One" reveals that she had witnessed the demon secretly feeding his blood to Sam. John investigated the incident and learned of the existence of the supernatural. His desire to find and kill Azazel led him to become a hunter of supernatural creatures. He took his sons with him during his travels, but often left them alone in motels for long periods of time during his hunts, leaving Dean with instructions to "shoot first and ask questions later" while watching over Sam. As revealed in the fourth season episode "Jump the Shark," John slept with a woman he met while away on a hunt. Learning over a decade later that he had fathered her son Adam, John made occasional visits over the years to partake in father-son activities with him. He hid the truth from Adam to protect him, and never revealed to him the existence of Sam and Dean, nor vice versa. Meanwhile, John trained Sam and Dean to become hunters. However, Sam later left this life to start anew in college, leading to a fallout between John and his son. Twenty-two years after Mary's death, John disappears while on a hunt, forcing Sam and Dean to reunite in an unsuccessful attempt to find him. Sam returns to the life of a hunter after Azazel kills his girlfriend. John reluctantly chooses to avoid his sons throughout most of the season while he investigates something, eventually reuniting with them in the episode "Shadow." However, the demonic Meg Masters attacks them and reveals that Azazel is after John. After escaping from Meg, the brothers split up from their father to keep him from the demons. When vampires murder his old mentor and steal the Colt—a mystical gun capable of killing anything—John teams up with Sam and Dean in "Dead Man's Blood" to retrieve it. Because demons cannot be killed by conventional means, they hope that the Colt will be effective against Azazel. In response, Meg begins killing the Winchesters' friends in "Salvation," and threatens to kill more unless they deliver the Colt. John is captured after trying to give her a fake gun, and reveals himself to be possessed by Azazel when the brothers come to his rescue in the first season finale "Devil's Trap." However, he manages to resist the demon's control. Despite John's pleas for Sam to shoot him with the Colt, Sam cannot bring himself to do so and allows Azazel to escape. As the Winchesters flee in Dean's Impala, a demonically-possessed trucker crashes into them. In the second season premiere, "In My Time of Dying," Sam and John awake in the hospital with only minor injuries, but a dying Dean is comatose. John secretly summons Azazel, and seems to know what the demon's plans are. He then makes a deal to save Dean, giving up his life, soul, and the Colt. Before dying, John tells Dean, if he can't save Sam, he'll have to kill him, should he become evil. The fourth season episode "On the Head of a Pin" reveals that the demon Alastair tortured John in Hell for over a century, with John refusing the demon's offer to stop if he himself would torture someone else. His soul escapes from Hell in the second season finale "All Hell Breaks Loose, Part 2" when a gateway to Hell is opened. He saves Dean from Azazel, and distracts the demon by temporarily forcing him out of his host, long enough for Dean to kill Azazel with the Colt when he returns to his usual body. John then gives Sam and Dean a loving smile before becoming engulfed in a white light. However, the fifth season episode "Dark Side of the Moon" suggests that he might not be in Heaven. In the show's three-hundredth episode, "Lebanon", Sam and Dean accidentally draw John from 2003 into their timeline when they acquire a Chinese pearl that grants the owner's greatest wish. This 'trip' allows John to learn of his father's disappearance, confirm his knowledge of the Apocalypse, witness the Men of Letters bunker, and learn about Mary's resurrection, as well as allowing Sam and Dean a chance to apologise to him for their past fights and forgive him for his failings as a parent. However, John being drawn into the future begins to cause changes to history; Dean and Sam see 'Wanted' posters identifying Dean as a serial killer, Sam is now an internet celebrity who is also the head of his own law firm, and Castiel is still a loyal servant of Heaven and the living Zachariah who attack the Winchesters to investigate the disruption to the timeline, although the Winchesters are able to kill Zachariah and banish Castiel. While the Winchesters debate about their next course of action before the new timeline changes them as well as everything else, they are eventually forced to send John back to his time believing that his trip to the future was just a dream, but he departs accepting his fate and assuring Dean and Sam that he understands their decision, also adding that he is proud of the men his sons have become. After Mary is accidentally killed by the Nephilim Jack Kline in "Absence", Castiel attempts to retrieve her from Heaven, but decides to leave her alone when he finds that she is with John Winchester once again, affirming that John went to Heaven after his escape from Hell. In the next episode, the angel Dumah confirms John and Mary are sharing a Heaven together and threatens to end their peace with a snap of her fingers to force Castiel to comply with her demands. In retaliation, Castiel kills Dumah with an angel blade to protect John and Mary and end her reign of terror. Regarding his portrayal of the character, Morgan commented, "I played him with extra angst. I think what was on the page, what I foresaw—not knowing where it was going, because no one would ever tell me anything—there was always a lot more going on in his head than he was going to show anybody, including his sons. Because, indeed, there was a lot more going on." Kripke later confirmed this, stating, "It's our view that John knew everything the producers of the show know. John knew stuff we're not even ready to reveal, that won't come out for a couple of seasons. He was an awesome hunter, and by the time he showed up in 'Dead Man's Blood,' he knew it all." In writing the pilot episode, series creator Eric Kripke made several dramatic revisions to John's storyline. The first draft of the script had Sam and Dean being raised by their aunt and uncle, though this was changed when Kripke realized that the backstory became much less complicated by having John raise them on the road. Another revision had John dying at the end of the episode instead of Sam's girlfriend Jessica. Though he survives in the final version of the pilot, the writers decided halfway through production of the first season that John did have to die, as they believed his separation from his sons "split the show" by having him away "doing more interesting things than the boys are doing." Kripke also felt that John kept Sam and Dean away from the "front lines," his death being required to allow the brothers to "explore, investigate and confront the yellow-eyed demon directly." The writers initially intended for John to die in the car accident in "Devil's Trap," but they ultimately postponed his death to prevent the finale from becoming too dark. Following the character's eventual escape from Hell, executive producer Ben Edlund stated that even the writers are unsure of where John's soul ended up. Evil Dead-actor Bruce Campbell was Kripke's first choice to portray the character. However, Campbell was unavailable, and Jeffrey Dean Morgan eventually received the role. Due to the fact that Morgan's scene in the pilot episode takes place 22 years before the series, Morgan expected to be replaced by an older actor for subsequent episodes. Being only 12 years older than Jensen Ackles, who portrays the eldest son Dean, Morgan was surprised when he was asked to reprise the role. Ackles and Jared Padalecki often teased him about the age difference during filming. Throughout the season, Morgan became frustrated at times due to his character's avoidance of his sons, stating, "It pissed off everybody, it pissed off us as actors, it pissed off the audience watching, because none of us really knew where we were gonna go." However, he reasoned that John's motivation for his actions was due to having knowledge that nobody else had. During production of Supernatural's first season, Morgan was also working on the shows Weeds and Grey's Anatomy, so he was often traveling back and forth between Los Angeles and Vancouver, British Columbia. 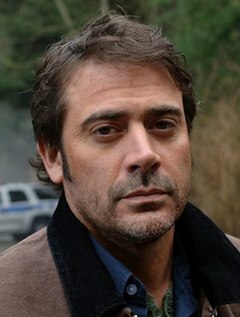 This interfered at times with Morgan's acting, as he had trouble getting "Winchester-y enough" after portraying the nice character of Denny Duquette on Grey's Anatomy. Morgan commented, "I was stuck in Denny-land, where I was being too nice. Winchester's harder to find. Denny's more me. He's an intense guy, John is. And Denny, for a guy who's having trouble living, he's just a charming dude." Morgan was at first reluctant to return for Supernatural's second season due to his role on Grey's Anatomy. Although he lent his voice for the third season episode "Long-Distance Call," future appearances of Morgan as the character after the second season have been hindered due to the actor's busy schedule. Nevertheless, both Kripke and writer Sera Gamble have stated that they "would love to have him back." The scheduling conflict has continued into the sixth season of Supernatural, with executive producer Robert Singer revealing that the writers had considered bringing the character back in the alternate reality episode "My Heart Will Go On" instead of Ellen Harvelle, but due to concerns that they would not be able to secure Morgan's return, they ultimately chose Ellen for the deceased character they would have (temporarily) return in the episode. During the production of the fifth season, Morgan had an interview with MovieWeb in which he stated that no one from the show had contacted him about making another appearance, and expressed the desire to return for at least one more episode in what was then-believed to be the show's final season, as he had enjoyed working with on-screen sons Jensen Ackles and Jared Padalecki and he felt that John's storyline had ended too soon. While critics praised Morgan for his performance in the role, their reaction to the character has generally been mixed. Don Williams of BuddyTV felt that John is a "rather divisive character", with some fans not understanding John's motivation for keeping his sons in the dark. However, Williams himself found the character to be "completely fascinating". He chose "In My Time of Dying" as the second best episode of the series, mainly because of John's contributions, stating, "Even if you're not a huge fan of Poppa Winchester, I think it's impossible not to be moved by the final ten minutes of this episode... John's final speech to Dean, where he finally tells his son that he's proud of him, is one hell of a tear-jerker, and both Jeffrey Dean Morgan and Jensen Ackles knock that scene out of the park." Williams praised Matt Cohen's performance of a younger version of the character in the time-travel episode "In the Beginning", believing that he "did an excellent job at portraying a more innocent John Winchester than we've ever seen before". Diana Steenbergen of IGN also criticized John for his lack of explanation, feeling that "it is not exactly easy to watch John treat Dean and Sam so dismissively, especially after they have been nearly killing themselves all season to find him". However, Steenbergen praised Morgan for his acting, writing, "Even though he is used sparingly throughout the series, Jeffrey Dean Morgan is always effective as John." She also felt that he brought "emotional weight" to the character, allowing the audience to "feel John's weariness, and his resignation that things will most likely not go well". While Brian Tallerico of UGO enjoyed Morgan's performance, he was happy that the character was killed off because John's presence made Sam and Dean into "followers" that were "merely existing in the wake of their father". With their father gone, the brothers are no longer prevented from "heading up the battle with the other side". Nicholas Knight (2007). Supernatural: The Official Companion Season 1. Titan Books. ISBN 978-1-84576-535-4. ^ "Eric Kripke Answers Fan Questions at Comic-Con". The CW Source. August 19, 2008. Retrieved December 18, 2009. ^ Sean Elliott (January 25, 2007). "Exclusive Interview: Supernatural's Eric Kripke & Robert Singer Return Dad to the Show & a Prequel Comic". IFMagazine. Archived from the original on February 17, 2009. Retrieved December 18, 2009. ^ "Jeffrey Dean Morgan returning to 'Supernatural' as John Winchester for 300th episode". ^ Writer: Adam Glass, Director: Serge Ladouceur (January 30, 2013). "As Time Goes By". Supernatural. Season 8. Episode 12. CW. ^ Caims, Bryan (February 2008). "In the Name of the Father". Supernatural Magazine (2). Titan Magazines. p. 28. ^ Writer: Jeremy Carver, Director: Steve Boyum (October 2, 2008). "In the Beginning". Supernatural. Season 4. Episode 3. CW. ^ Writer: Sera Gamble & Nancy Weiner, Director: Steve Boyum (February 4, 2010). "The Song Remains the Same". Supernatural. Season 5. Episode 13. CW. ^ a b c d Writer: Eric Kripke, Director: David Nutter (September 13, 2005). "Pilot". Supernatural. Season 1. Episode 1. WB. ^ Writers: Sera Gamble, Director: Robert Singer (May 10, 2007). "All Hell Breaks Loose, Part 2". Supernatural. Season 2. Episode 21. CW. ^ a b Writer: Jeremy Carver, Director: J. Miller Tobin (December 13, 2007). "A Very Supernatural Christmas". Supernatural. Season 3. Episode 8. CW. ^ Writers: Andrew Dabb & Daniel Loflin, Director: Adam Kane (January 29, 2009). "After School Special". Supernatural. Season 4. Episode 13. CW. ^ Writers: Andrew Dabb & Daniel Loflin, Director: Phil Sgriccia (April 23, 2009). "Jump the Shark". Supernatural. Season 4. Episode 19. CW. ^ Writer: Eric Kripke, Director: Ken Girotti (November 15, 2005). "Home". Supernatural. Season 1. Episode 9. WB. ^ Writer: Eric Kripke, Director: Kim Manners (February 28, 2006). "Shadow". Supernatural. Season 1. Episode 16. WB. ^ Writers: Cathryn Humphris & John Shiban, Director: Tony Wharmby (April 20, 2006). "Dead Man's Blood". Supernatural. Season 1. Episode 20. WB. ^ Writers: Sera Gamble & Raelle Tucker, Director: Robert Singer (April 27, 2006). "Salvation". Supernatural. Season 1. Episode 21. WB. ^ Writer: Eric Kripke, Director: Kim Manners (May 4, 2006). "Devil's Trap". Supernatural. Season 1. Episode 22. WB. ^ Writer: Eric Kripke, Director: Kim Manners (September 28, 2006). "In My Time of Dying". Supernatural. Season 2. Episode 1. CW. ^ Writer: Raelle Tucker, Director: Rachel Talalay (January 11, 2007). "Hunted". Supernatural. Season 2. Episode 10. CW. ^ a b Writers: Eric Kripke & Michael T. Moore, Director: Kim Manners (May 17, 2007). "All Hell Breaks Loose, Part 2". Supernatural. Season 2. Episode 22. CW. ^ Writer: Ben Edlund, Director: Mike Rohl (March 19, 2009). "On the Head of a Pin". Supernatural. Season 4. Episode 16. CW. ^ Writers: Andrew Dabb & Daniel Loflin, Director: Jeff Woolnough (April 1, 2010). "Dark Side of the Moon". Supernatural. Season 5. Episode 16. CW. ^ John Kubicek (April 24, 2009). "Supernatural: Papa Winchester Was a Rolling Stone". BuddyTV. Retrieved August 16, 2012. ^ # Nicholas Knight (2008). Supernatural: The Official Companion Season 2. Titan Books. p. 143. ISBN 978-1-84576-657-3. ^ Neil Wilkes (February 15, 2007). "'Supernatural' writer John Shiban". Digital Spy. Archived from the original on September 3, 2010. Retrieved September 22, 2009. ^ Jennifer Godwin (July 26, 2009). "Supernatural's Deviled Execs Spill (Many) Season Five Secrets". E! Online. Retrieved December 29, 2009. ^ Lloyd, Kate (December 2007). "Lore & Order". Supernatural Magazine (1). Titan Magazines. p. 19. ^ a b c Kate O'Hare (July 12, 2008). "Actor Morgan Juggles 'Grey's,' 'Supernatural' and 'Weeds'". Zap2it. Retrieved December 18, 2009. ^ William Keck (April 20, 2006). "Jeffrey Dean Morgan awaits his fate". USA Today. Retrieved September 22, 2009. ^ a b Neil Wilkes (June 30, 2008). "'Supernatural' writer talks season four". Digital Spy. Archived from the original on August 23, 2010. Retrieved December 29, 2009. ^ Michael Ausiello (August 19, 2009). "Ask Ausiello: Spoilers on 'Grey's,' 'House,' 'NCIS,' 'Bones,' 'Gossip Girl,' 'Supernatural,' and more!". EW.com. Archived from the original on August 26, 2009. Retrieved September 22, 2009. ^ "'Supernatural': How John Winchester almost returned in tonight's episode". Entertainment Weekly's EW.com. ^ "Exclusive: Jeffrey Dean Morgan Wants to Return to Supernatural This Season!". MovieWeb. September 14, 2009. Retrieved December 18, 2009. ^ Don Williams (September 11, 2008). "Top 10 'Supernatural' Episodes of All Time: #2 "In My Time of Dying"". BuddyTV. Retrieved December 18, 2009. ^ Don Williams (October 3, 2008). "Supernatural: Meet Mary Winchester, Demon Hunter". BuddyTV. Retrieved December 18, 2009. ^ Diana Steenbergen (September 3, 2008). "Supernatural Flashback: "Dead Man's Blood" Review". IGN. Retrieved December 18, 2009. ^ Diana Steenbergen (March 20, 2008). "Supernatural: "Pilot" Review". IGN. Retrieved December 18, 2009. ^ Diana Steenbergen (September 10, 2008). "Supernatural Flashback: "Salvation" Review". IGN. Retrieved December 18, 2009. ^ Brian Tallerico. "Supernatural Episode 2.1: "In My Time of Dying" Review". UGO. Archived from the original on June 16, 2011. Retrieved December 18, 2009. "Out of the Darkness, Into the Fire"
"The One You've Been Waiting For"
"Celebrating the Life of Asa Fox"
"Lily Sunder Has Some Regrets"
This page was last edited on 19 April 2019, at 17:34 (UTC).